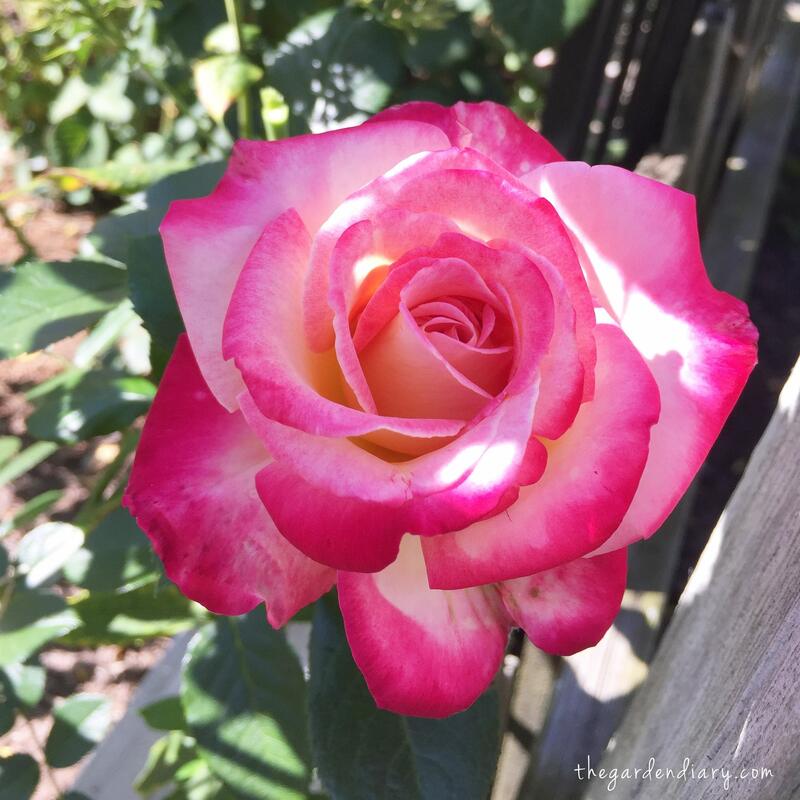 2015 was a beautiful rose year in my neck of the woods. To pick only 5 roses from this year provides quite a challenge. But, I do want to get down to some of the top performers in my Zone 5 garden and share some standouts with you. So, it is best to give them 3 years in your garden to prove what they can do and be for you. This rose was hybridizing giants Tom Carruth and Christian Bedard. Petit Pink – Shrub: This easy care shrub from the Proven Winners OSO Happy series bloomed all summer with no sign of disease. Looks good up close and from far away. The long-lasting blooms are small—about an inch in diameter. Little Mischief – Shrub: (Easy Elegance Collection) These adorable deep pink sprays look amazing in the garden as well as in arrangements. 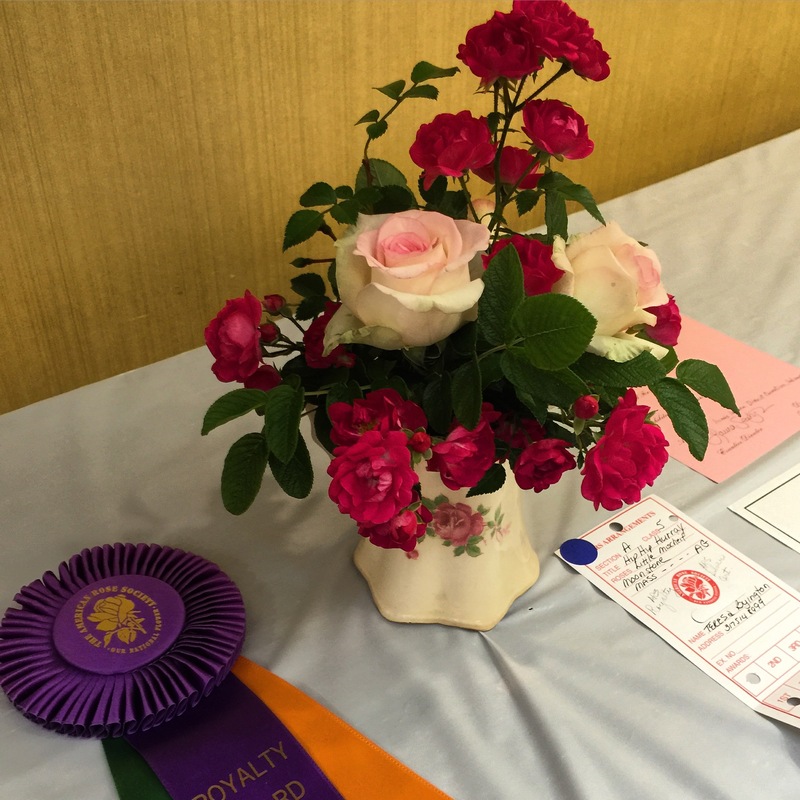 I should know… arranging these little blooms put me in the winners circle at our local district rose show! Music Box – Shrub: (Easy Elegance Collection): This is a shrub rose with a pretty little bud and a hybrid tea like bloom. True to the series name, this rose is easy and elegant and completes the package with a lovely fragrance. 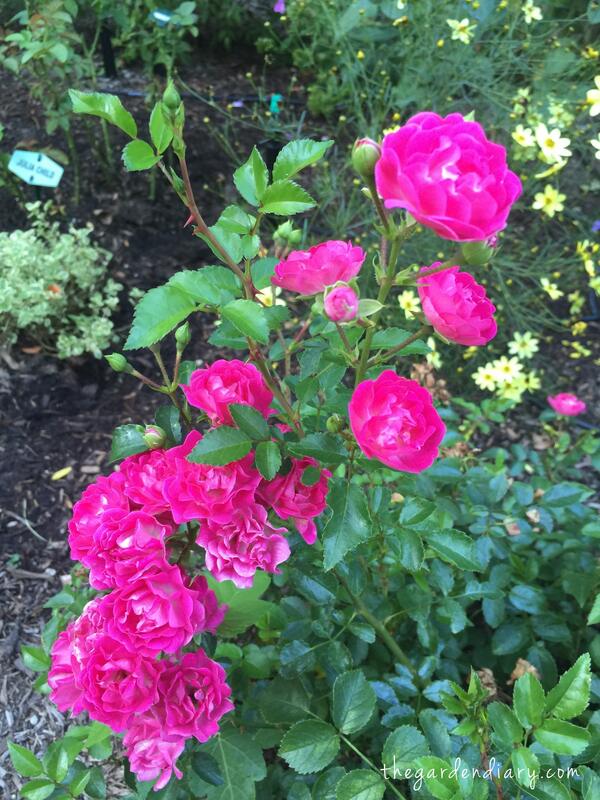 More information @ http://www.easyeleganceroses.com/roses I bought mine the last two years from my local Lowes. 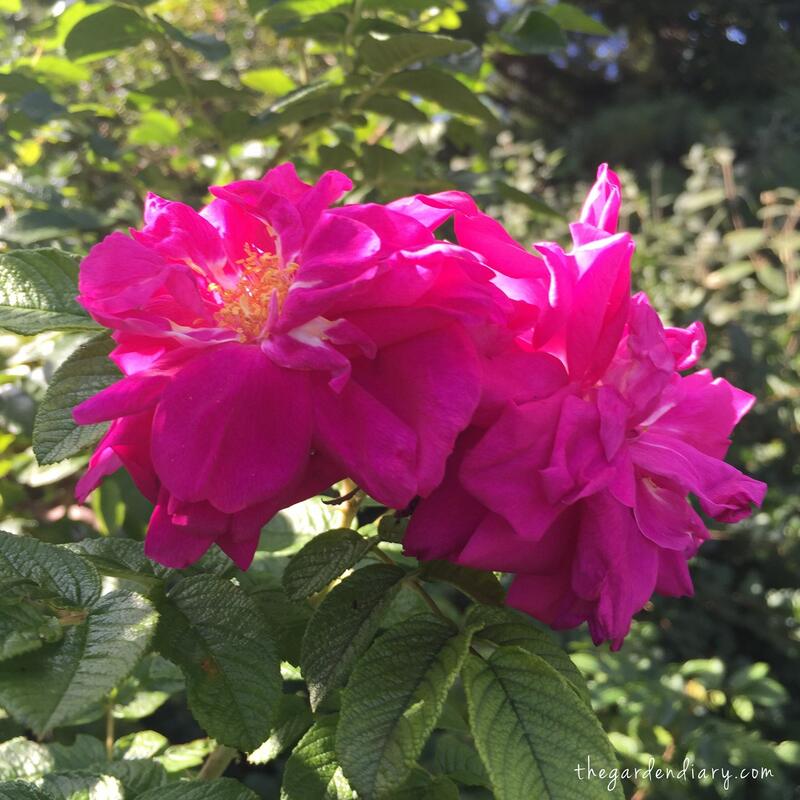 Moje Hammerburg – Rugosa: This rose could not be easier or prettier or more fragrant. A medium size Rugosa — some of them can get quite large! If you are not familiar with Rugosas, let me tell you there is not a more hardy, disease resistant family of roses. There were so many beautiful roses this year. Look at some of my recents posts and you will see many more! Like many of you, I am now beginning to make a list of wants and needs for next year. One that is already on the list is my second Tahitian Treasure from Star Roses and Plants. She was a late bloomer and it took the 3 years for her to really show off. But this rose was fabulous this year. Pretty, fragrant, disease resistant and very long lasting in a vase! 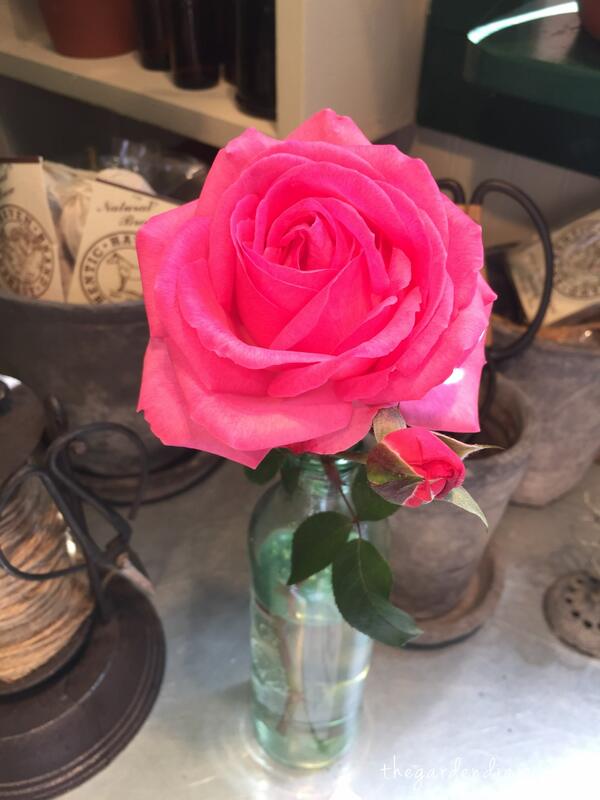 This rose was on my potting shed desk for more than a week when I took this picture! 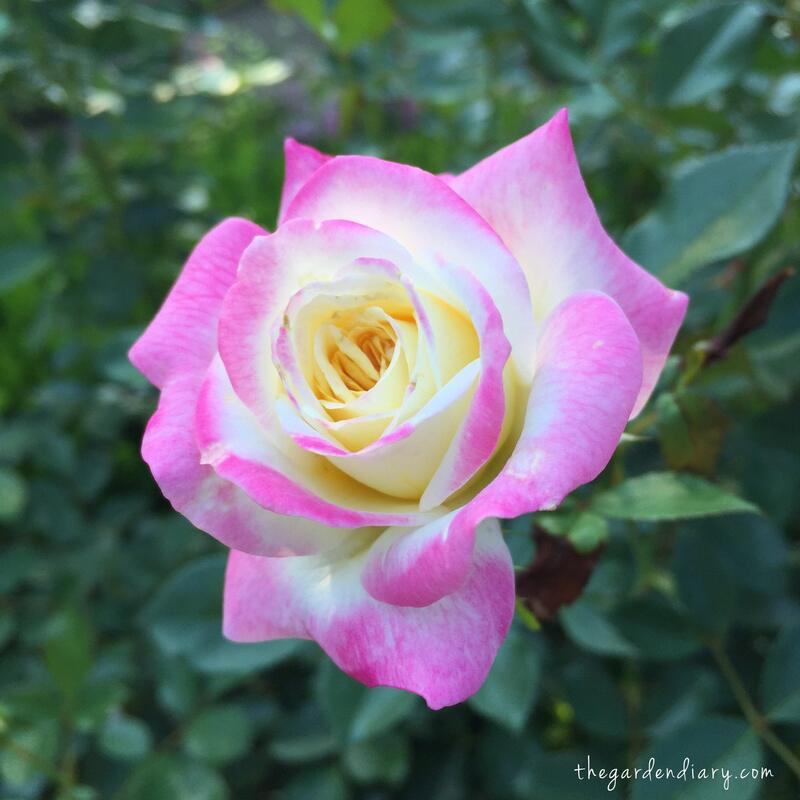 Belinda’s Dream: A rose from the Earth Kind Rose collection. 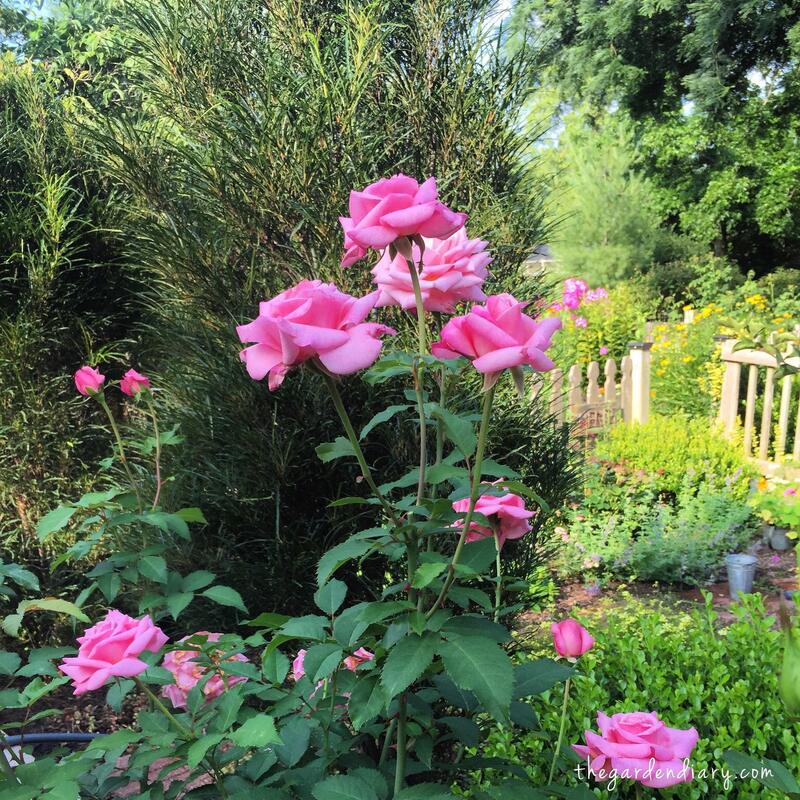 This floriferous rose has beautiful form, is disease resistant and has a beautiful fragrance. This picture show’s Belinda’s Dream growing in a large pot on my deck. She will over winter in her pot in our dark, slightly heated garage. Fingers crossed she will emerge in April ready for another wonderful year! 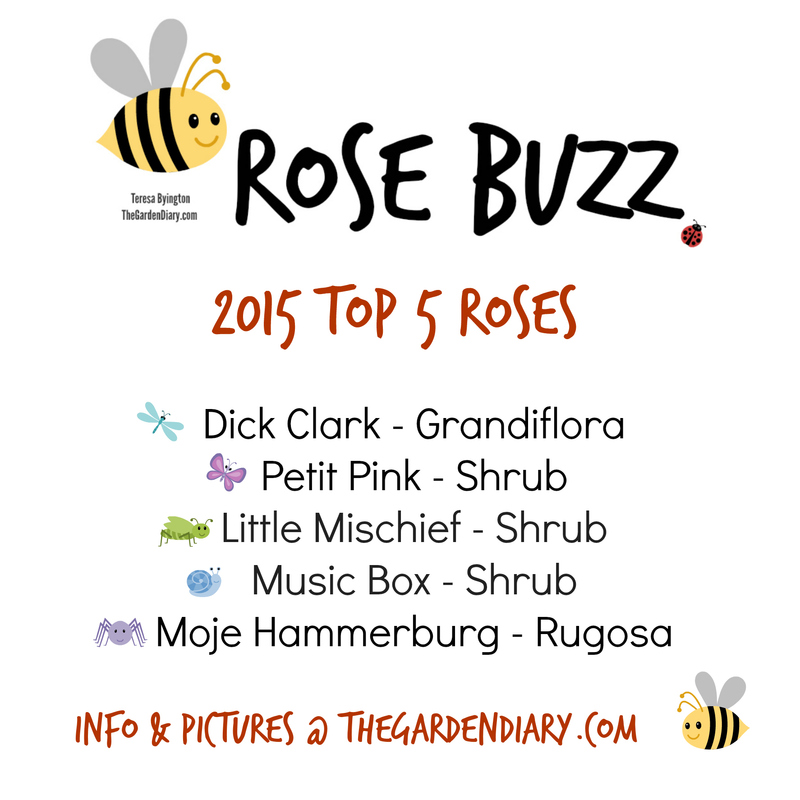 Note: All my roses that I over-wintered in the garage last year did very well! 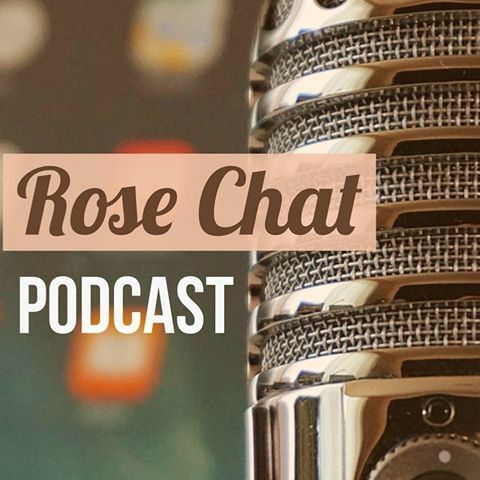 If you have roses that have done particularly well for you this year, please share the name and your growing zone in the comment section below. We learn best from each other! A yellow that does well for me is Golden Fairy Tale from Kordes. Take a look at Coretta Scott King too, it has more orange in the bloom than pink. There are a couple yellow ones in the Easy Elegance collection but I don’t have experience–yet! LOL I love those roses! I love Julua Child but it isn’t as disease resistant for me. Hope this helps! Laura…it would help to know where you are at…Julia Child is great in my dry Utah climate. I don’t think you can beat Just Joey…Good as Gold is also a nice rose that is a variety of colors starting with a orange and fading to a nice golden yellow with red highlights…SunSprite is a nice pure yellow that stays very small…around 2′. Other nice roses are Betty Harkness, Scent-Sation,Paul Shirville(coral), Louise Clements etc I could go on and on…plus all these roses have a great fragrance…a requirement to make into my garden…if you live in a colder area I had a lot of luck with the David Austin roses in my zone 4 garden in Minnesota…they would die back to the snow line but came back strong year after year…and of course the rugosas and the Canadian series…love your garden and blog Teresa! Thank you, Teresa. I appreciate learning about roses that do well in my zone. Laura, in addition to the roses Teresa suggested, take a look at Cinco De Mayo. 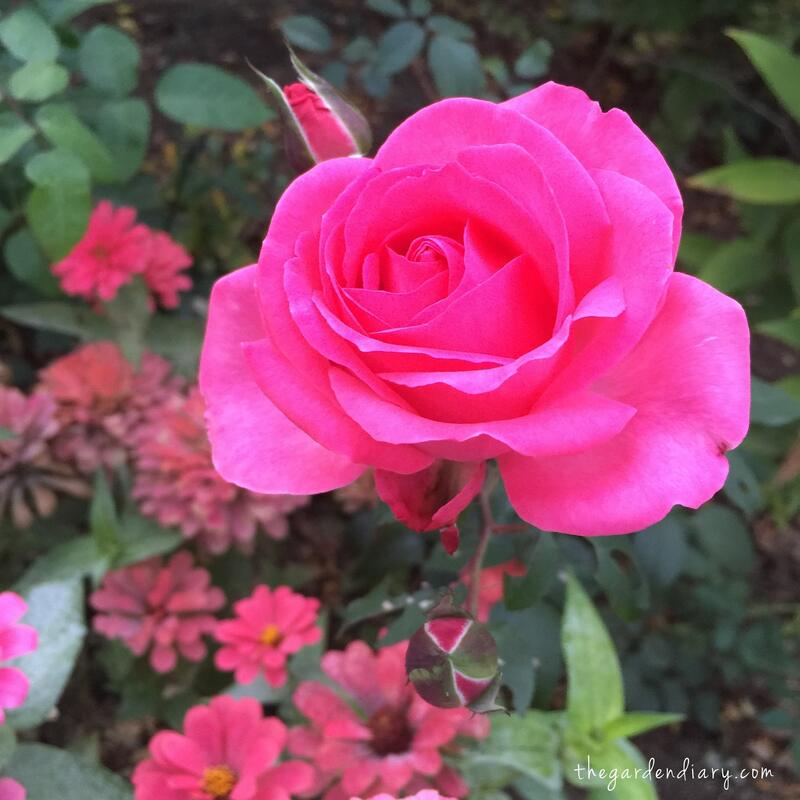 It adds interest to a pink garden. I nearly died when I saw those extremely bright orange buds, but they opened into the most wonderful blend of rose..lavender..russet blossoms. It blends well with the roses Teresa suggested and with pink. As for my 2015 picks, they are all new for me this year, but did so well, I was impressed. Cape Diamond shot out one long cane after another with clusters of perfect pink blooms and behaved like a 2nd or 3rd year rose. Mollie’s almost translucent peachy petals won my heart with the amount of bloom and it’s glossy foliage, and they last and last. I liked it so much, I went back for another. I also added Wild Blue Yonder and Outta the Blue because I couldn’t decide between the two. Very similar, but Outta the Blue is the winner in my garden. The center of the bloom shows a bit of lavender and yellow. I went back for two! more of this rose. None of these showed any sign of powdery mildew, the biggest problem I have here in eastern WA, zone 5. 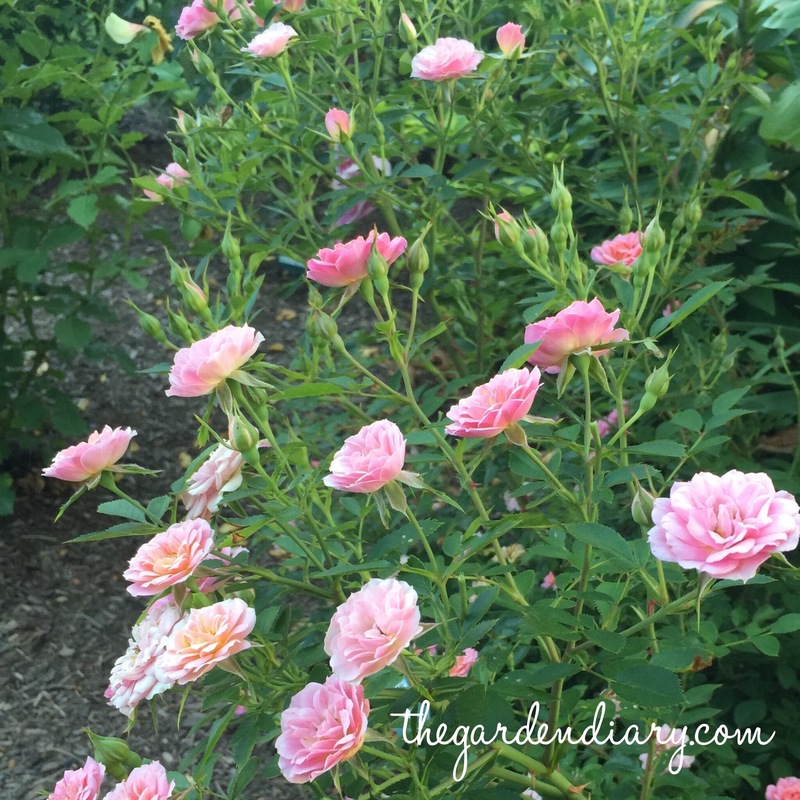 Cape Diamond and Cinco De Mayo are roses I have considered for sure. I appreciate your review. I am not familiar with Mollie. From the sound of things, I need to search it out. 🙂 Another yellow I didn’t mention is the climber Golden Gate by Kordes. Very hardy and vigorous grower! They were all so beautiful – how do you choose! 🙂 Love your roses. Gorgeous! 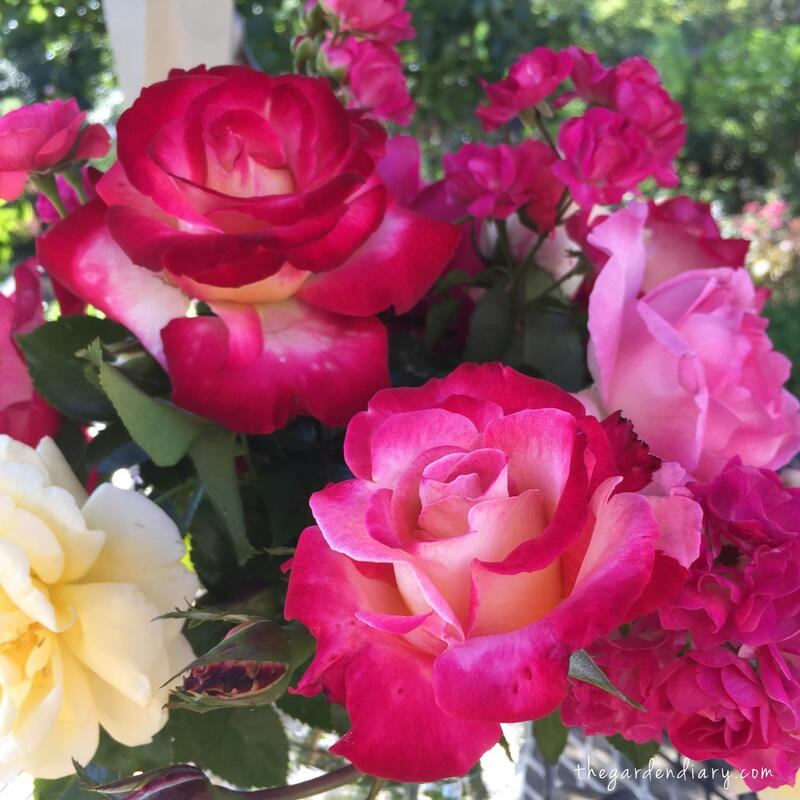 Just love your roses..always so stunning, vibrant and healthy. Thank you. It is time for them to go to sleep and I will miss them!